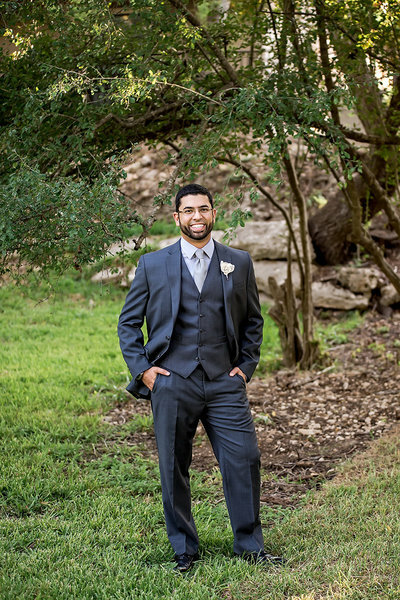 It is easy to see why Mackenzie and Sky chose Hacienda del Lago to host their wedding. 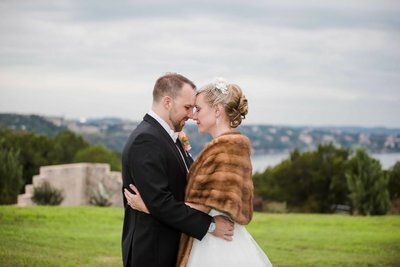 There are few places in Central Texas where you can find as much beauty as in the Hill Country, and even fewer wedding venues that offer such a stunning view of Lake Travis. Despite the impending threat of rain all day, the owner assured us that of the hundreds of events they had hosted throughout the years they had only had to implement a rain contingency plan a couple of times. Call it luck, good fortune, or just a coincidence, but the weather cooperated all day so we could enjoy the gorgeous outdoor ceremony as planned! While Sky and his groomsmen played golf and relaxed throughout the morning, the girls were busy getting ready in the bridal suite with the amazing artists from Blush’d Beauty. The energy filled the house as we hurried from room to room making preparations for the big day. Every last detail was perfectly put into place, transforming the garden lawn into a serene backdrop for the ceremony, while inside the reception area, the teams from Treasured Blossoms and Monarch Event Rentals bustled around, adding the finishing touches. At long last it was time to get dressed! The groomsmen toasted as they put on their jackets and headed toward the venue. 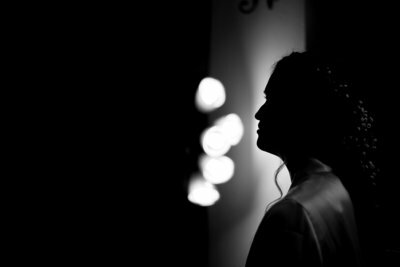 The girls gathered their dresses and gushed over the matching earrings they were to wear, while Mackenzie stepped into her delicate lace gown. After some slight adjustments to make sure everything was in place (hello Maid of Honor duties!) and some help from her sister Melissa to get her shoes on, we headed outside for bridal portraits. As the sun began to drift toward the horizon, the entire ceremony site was bathed in gorgeous warm light and guests began to find their seats. The string trio played softly to announce that it was time to begin, and Sky made his way to the altar, escorted by his entourage of very dapper groomsmen. Above his head, the white lanterns bounced joyfully in the breeze. 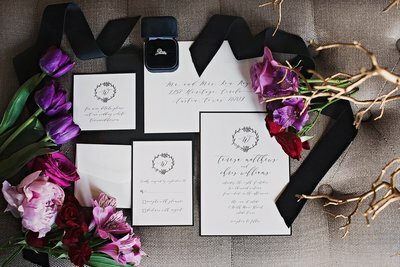 Everyone turned to see the line of bridesmaids in their rose-colored gowns, followed by the flower girl in matching pink, and the ring bearer in his white suit. With the exchange of rings and that first kiss as husband and wife, it was finally official! Everyone cheered as Mackenzie and Sky turned to make their way back down the aisle as a married couple. 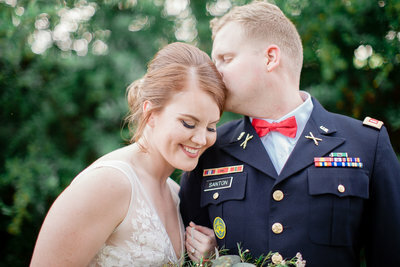 They turned together for one more kiss before heading back to the house, and as their friends and family gathered for the reception, the energy was tangible in the air. It was time to celebrate!